IPCU Director Kazım Gökhan Elgin delivered a speech in the Conference on New Era in Seismic Isolation. 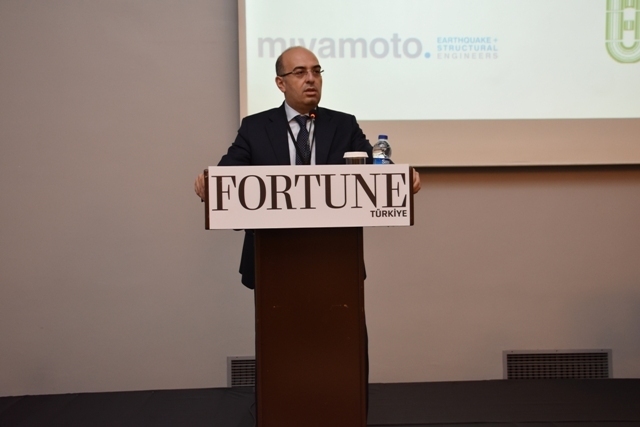 The Conference on New Era in Seismic Isolation organized by Fortune Turkey bringing together experts in their fields took place in Istanbul on June 15, 2016. In the conference which addressed issues including what is the seismic isolation, what is its importance for our country, “Earthquake Regulations for New Buildings”, and what should be done in this regard, Fortune Turkey Managing Editor Cüneyt Toros delivered the opening speech which was followed by a speech by IPCU Director Kazım Gökhan Elgin about their efforts and activities which they performed in Istanbul under Istanbul Seismic Risk Mitigation and Emergency Preparedness Project (ISMEP). The projects for Göztepe Training and Research Hospital, Kartal Training and Research Hospital, Okmeydanı Training and Research Hospital, and Marmara Başıbüyük Training and Research Hospital, the most important hospitals of Istanbul, among others, are planned according to seismic isolation method, and total 2690 seismic isolators will be used, Elgin said. Elgin pointed out that quality prevailed quantity in said projects so they employed top experts in this field. In the conference, IPCU Deputy Director Yalçın Kaya also gave the participants insights into application stage of seismic isolation, and projects performed by IPCU. Prof. Dr. Mustafa Erdik, President of Earthquake Association of Turkey, d e l i v e r e d a speech addressing the new regulation, and expressed his thanks to IPCU for their delicate approach and being a pioneering organization in this field. In the conference where videos of buildings featuring seismic isolation method taken during earthquake in Japan were displayed, it was pointed out that even multistorey buildings featuring isolators resisted against move, i.e. shocks, unlike other buildings, and accordingly people in such buildings did not feel any shocks during and after the earthquake, and no technical problem was detected i n s i d e buildings (electric and water system failures, etc.). In the conference, it was concluded that companies that suffered interruption of business due to technical failures -though not severe- attributable to earthquake incurred loss, and therefore, this issue should be handled both socially and economically. The speakers emphasized that following the earthquake that hit Japan in April 2016, the technology company Sony closed its plants in Kumamoto and Nagasaki for a few days, with other technology companies also being forced to interrupt manufacturing for a few days; and that automobile manufacturers including Honda, Mitsubishi, Nissan and Toyota were made to close their manufacturing plants as a result of that disaster. In hospitals where seismic isolation technology is used, IPCU aimed to ensure that such hospitals will provide uninterrupted service during and after an earthquake. In the hospitals which were designed to be as comfortable as a five star hotel, the rooms were designed as single and double rooms, with the single rooms being equipped with qualified bed technologies which enable use of such single rooms as double rooms in case of emergency. When the hospitals are completed, they will be the first public hospitals of Turkey to have LEED Gold Certificate, an internationally recognized environmentalfriendly building certification.